The new album from Richard Thompson is a raw, unfiltered affair from a veteran artist who shows no signs of slowing down. Richard Thompson has been part of the musical landscape for more than 50 years – as a founding member of seminal folk band Fairport Convention, as a singer/songwriter duo with his (now) ex-wife Linda, and as a highly prolific solo artist. With that in mind, it's oddly assuring that his latest album, the brilliant, engaging 13 Rivers, manages to eschew any kind of gilded production techniques or fussy concepts. It's further proof – as if we needed any – that Thompson's songs and stellar guitar playing speak for themselves. 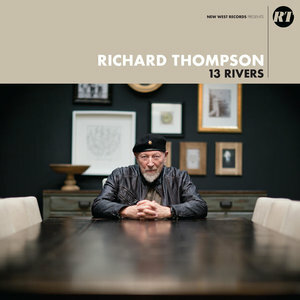 13 Rivers is Thompson's first self-produced work in more than ten years, recorded on analog equipment in just ten days. Joined by his faithful sidemen Michael Jerome (drums), Taras Prodaniuk (bass) and Bobby Eichorn (guitar), Thompson plugs a baker's dozen of excellent new songs into this stripped-down lineup, and the results are loud, potent and visceral. There's a reassuring power to the music, an affirmation that this 69-year-old legend is not phoning it in or going the nostalgia route. He still has a great deal of good music left to share. The album begins not with a bang, but a simmer – "The Storm Won't Come" is powered by minor keys and a propulsive Bo Diddley drum beat, with lyrics that anticipate and welcome change but realize that it's a natural process. "I'm longing for a storm to blow through town," Thompson sings, "And blow these sad old buildings down / But the storm won't come." On "Rattle Within", he channels some noisy Tom Waits-style percussion and pairs it with plenty of raucous guitar soling (if there was any doubt as to the current state of Thompson's legendary guitar skills, rest assured – the playing on this album is typically fantastic, and the soloing is vast and plentiful). Lyrically, Thompson has often been fascinated – some might say obsessed – with darkness and morbidity, even if the music doesn't always reflect that. "Bones of Gilead" pairs a caffeinated, quasi-rockabilly vibe with allegoric subject matter ("What's my name / Just call me Micah / Micah like the Bible says / I can't help it, it's within me / Runes are written on my face"). Likewise, the tight, funky "Trying" almost sounds like Thompson's vying for a freak mainstream hit – the addictive hooks of the chorus certainly help - but the underlying darkness would seem (thankfully) out of place alongside today's carefully marketed pop stars. While 13 Rivers is promoted in the press materials as "a bare-bones" affair "with no filters", there are moments when the rawness is adorned with an additional sonic layer or two. But it's very much in keeping with Thompson's style. "Oh Cinderella" is a mandolin-fueled waltz tempo singalong that wouldn't sound out of place on his acclaimed 1991 Rumor and Sigh album. "You Can't Reach It" has chunky riffs and soaring melodies that almost resemble American heartland rock (a rare and enviable feat for the positively British Thompson). But for the most part, 13 Rivers is an album that sticks close to a vision of darkness, gloom, and noise. Thompson has written his usual share of memorable songs and his small, dedicated band attack the compositions with relish. With razor-sharp wit, a seemingly endless reservoir of imaginative guitar-playing, and a restless sense of musical adventure, Richard Thompson is still blowing away the competition, even those more than half his age.